Beam losses refer to fractions of the beam which deviate from the nominal beam orbit and impinge on the accelerator components. Beam Loss Monitors (BLMs) are radiation detectors located along the accelerator beamline in order to observe the charged particle showers generated by beam losses. Highly adaptable device with a range of options to suit individual users and facilities. Extremely radiation hard device providing a long working life in a high radiation environment. Capable of providing a continuous spatial and angular loss map on any beamline. Applicable to both high and low energy facilities using any charged particle beam. Options range from a fully embedded package, including initial calibration, to stand alone devices. Maintains standard BLM functionality: machine protection, activation level controls and provides additional diagnostic capabilities. Provides protection over a full beamline, rather than discrete points – preventing potential beam induced damage in currently difficult to monitor areas. 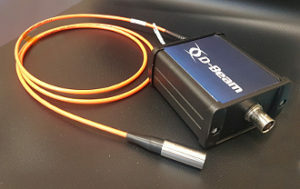 Provides localization of beam loss origin with a resolution down to 10 cm – providing additional tuning information. Capable of monitoring individual beamline elements or stretches of beamline >100m long. Modular system consisting of a distributed radiation sensor, Electro-optical interface, and Digitisation. Selection of modules depending on: position resolution; time resolution; sensitivity; and dynamic range. Electron machines in the >10 MeV range. Free Electron Lasers: the system is particularly useful in undulator regions; the system is insensitive to magnetic fields and synchrotron radiation. RF cavity characterisation: provides non-invasive identification and characterisation of RF cavity breakdown. The system can be optimised to provide localisation of emission points in and around RF cavities. Nuclear facilities: by encircling the core of a reactor it is possible to map angular and spatial emission inhomogeneity. A D-Beam BLM sensor is currently in operation at the CLARA accelerator facility (STFC, UK).